Do you LOVE Appetizers as much as we do? For New Year's Eve, do you go out, or have a party at home, or stay in and be cozy? Regardless of what we do, our favorite part is the party food. So we are excited to share all these delicious and savory appetizers from Treasure Box Tuesday to help you ring in 2015! 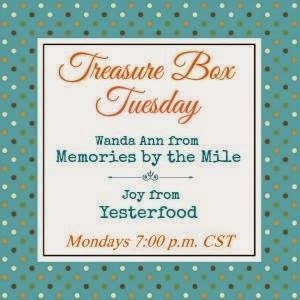 Don't forget to join us tonight and every Monday evening at 8:00 p.m. Eastern Time for Treasure Box Tuesday! We shared these appetizers at our favorite parties, including Metamorphosis Monday! So many awesome recipes ! Thanks for including my Cheese Ball, Joy ! How do I pick 2-3? Too many choices and they all sound delish! Wishing you and your family a very Happy New Year with abundant blessings in 2015! Thanks so much for the feature this week and all the wonderful parties in 2014! What a great round up. Perfect for game day treats and party appetizers. Thanks for sharing this on Merry Monday. I think I could live on appetizers. They are so yummy. Thanks for linking up to the Bloggers Brags Pinterest Party. I have pinned this post to the Bloggers Brags Pinterest Board. Awesome roundup! Thanks for posting it to the Merry Monday linky party!